Maleic anhydride is mainly used in the production of significant chemicals, such as unsaturated polyester resins, 1,4-butanediol, fumaric acid, lubricating oil additives. The chemicals let MA be an useful intermediate in food, oil or polymer industry. MA has applications in the manufacture of pharmaceuticals, agrochemicals, household products. 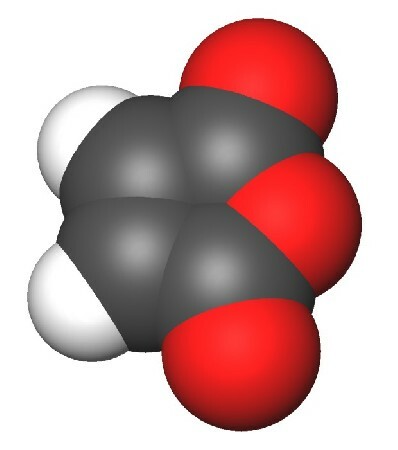 Maleic anhydride (MA) is a white crystalline solid with a sharp, penetrating acrid odor. It is soluble in water, acetone, alcohol, and dioxane, partially soluble in chloroform and benzene. Stable under normal conditions. Combustible. The solution in water is a medium strong acid. It is incompatible with strong oxidants, alkaline metals, piridine, amines, alkalis, quinoline. It is an excellent joining and cross linking agent. Its major end use is in the manufacture of the unsaturated polyester resins (UPR), 1,4-butanediol (BDO), fumairc acid, lubricating oil additives, tetrahydrofuran (THF) and gamma-butyrolactone. The remainder is consumed in uses including copolymers in the engineering polymers sector, plasticizers, agricultural chemicals, alkenyl succinic anhydrides, alkyd resins, and a number of specialty chemicals such as tartaric acid, diethyl and dimethyl succinate, glyoxylic acid, malic acid, diisobutylhexahydrophthalate (DIBE), dodecene succinic anhydride, methyl tetrahydrophthalic anhydride esters. Maleic anhydrie dimerizes in a photochemical reaction to form cyclobutane tetracarboxylic dianhydride (CBTA). This compound is used in the production of polyimides and as an alignment film for liquid crystal displays. The food industry uses MA in artificial sweeteners and flavour enhancements. Lubricating oil additives are used in gasoline and diesel engine crankcase oils as dispersants and corrosion inhibitors. BDO is used in the production of thermoplastic polyurethanes, elastane/Spandex fibres, polybutylene terephthalate (PBT) resins. Chopped glass fibres are added to UPR to produce fibreglass reinforced plastics which are used in a wide range of applications such as pleasure boats, bathroom fixtures, automobiles, tanks and pipes. Personal care products consuming MA include hair sprays, adhesives and floor polishes. MA is also used in water treatment chemicals and detergents. Manufacturing of insecticides, herbicides and fungicides. Manufacturing of glue for paper. Chemical intermediate in the synthesis of pharmaceuticals. Ingredient in bonding agents used to manufacture plywood. Ligand for low-valent metal complexes, examples being Pt(PPh3)2(MA) and Fe(CO)4(MA).